Shadows are a normal part of the forest, but they are still intriguing to study and stare at. I, admittedly, do not completely understand them (which is why I occasionally spend time staring at them). If there is one thing I do understand about shadows, however, it is that they take a long time to do anything (well, the one thing they can do as far as I can tell: move). Whenever I find myself sitting by a shadow and trying to understand it, I begin to think about what I am really doing as I stare at the mysterious, blackness on the ground: waiting. I am waiting. Of course, I tend do a lot of waiting for all kinds of different activities on a regular basis, but nothing really forces me to actually consider waiting like staring at shadows. So I think about waiting while I wait for the shadows to reveal their more personal characteristics (which they have not done so far). What do I do when I wait? What does it mean to wait? Why bother waiting? Why not stop waiting and start doing something else that does not involve waiting (leaving, eating, smelling, etc.). When I wait, I am forced sit alone with my thoughts. That can be a fun thing to do, but it can also be a horrifying thing to do. For every thought that is about licking moss or getting to know a tree, there are just as many thoughts about getting attacked by something larger than myself or deer. It is easy to get lost in thought while waiting. In fact, that seems to be the main thing to do while waiting. I suppose the bad thoughts are important, anyway. 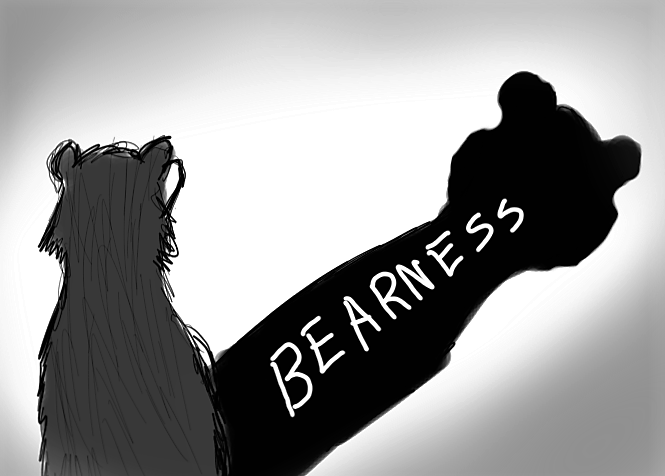 After all, getting to know your bearness is just as much about the good thoughts as it is the bad. Waiting is a tough thing to convince yourself to enjoy, though. When you are not waiting, you really have no desire to wait. It is really something you do only when you absolutely have to do it, but the more I think about waiting while I wait for something, the more realize that it is a crucial part of being a bear and (likely) being an anything else. Trees seem like they only wait, and they are by far the wisest things in the forest (that is probably because they are perpetually thinking about their treeness, so they understand themselves (and themselves are essentially the everything of the forest) better than any other thing in the forest). I do not understand shadows. I do not know why they are here and how they got here and whether or not they like me. That is okay, though. They make me wait to try to understand them. And that waiting helps me know me a little better. I do hope they like me, though. This entry was posted in Bear thoughts and tagged @a_single_bear, bears, humor, nature, rocks, shadows, the forest, thinking about waiting, twitter, waiting on June 20, 2016 by A bear. Why do shadows matter? Trees? What does it matter if shadows like you? Do you like shadows? Don’t worry about trees or shadows. You are a bear. Oh and one more thing… Close your mouth and things won’t fall out. You are a bearded bear.